Deidre DeJear announced her candidacy for Iowa secretary of state last August, on the 52nd anniversary of the signing of the Voting Rights Act. It was a fitting date: DeJear, 32, was born in Mississippi, where her grandparents were not able to vote before the Voting Rights Act, and now she was trying to become the first African American to win a statewide election in Iowa history. She was also trying to reshape voting rights in the state: Her opponent, incumbent Paul Pate, had authored a voter ID law passed by Iowa’s Republican state Legislature in 2017 that threatened to disenfranchise thousands of eligible voters. It was a prime example of how Republican secretaries of state have used their office to restrict access to the ballot, and how Democratic challengers are now seeking to fight back. Republican secretaries of state like Pate, Kris Kobach in Kansas, Brian Kemp in Georgia, and Jon Husted in Ohio have led their party’s efforts to make it harder to vote, through aggressive voter purges, strict ID laws, and new barriers to voter registration. Though secretaries of state do not pass election laws, they design and implement them as the top state election officials. They decide how registration lists are maintained, where polling places are located, and how voting machines are secured. The recent furor in Georgia over Kemp’s blocking of 53,000 voter registration applications—80 percent from people of color—at the same time he’s running for governor has shined a spotlight on the importance of this once-obscure office. Republicans currently control 29 secretary of state offices, compared to 17 for Democrats. (Pennsylvania has a nonpartisan secretary of state, and three states don’t have the office.) But a new crop of Democratic candidates like DeJear could pick up at least half a dozen secretary of state seats in 2018 in key swing states such as Arizona, Colorado, Georgia, Iowa, Michigan, Nevada, and Ohio. Governing magazine lists eight of the 26 secretary of state races this year as toss-ups, and says six of them have shifted in the Democrats’ favor since June. These Democratic candidates are running on platforms that would expand voting rights, and their victories would give Democrats the power to shape voting laws in critical states that could determine the outcome of the 2020 presidential election and the round of redistricting that will follow. 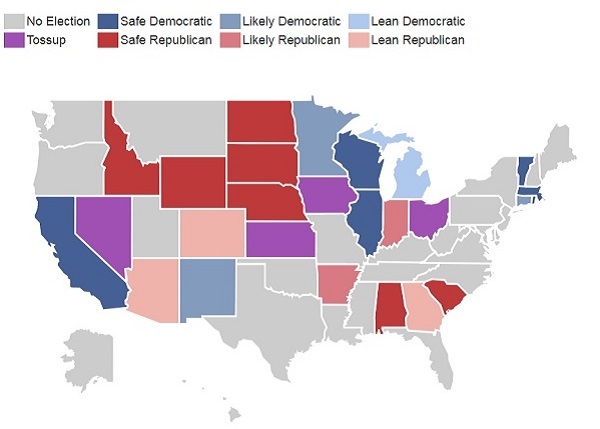 Ratings for 2018 secretary of state races. Reprinted with permission of Governing magazine. The office gained national prominence during the 2000 election, when Florida Secretary of State Katherine Harris, a state co-chair of the Bush-Cheney campaign, halted her state’s recount to elect George W. Bush. Four years later, Ohio Secretary of State Ken Blackwell, who co-chaired the Bush-Cheney reelection campaign in the state, issued a series of directives limiting the availability of provisional ballots and blocking voter registration applications. Blackwell oversaw an election in Ohio, the state that tipped the contest to Bush, in which voters in Democratic strongholds like Columbus waited five hours to vote because polling locations in urban areas didn’t have enough voting machines. “Two Republican secretaries of state decided two presidential elections,” says Ellen Kurz, who founded the advocacy group iVote in 2014 to elect Democratic secretaries of state who support voting rights. The secretary of state position took on added significance when politicians like Kobach, Kemp, and Husted were elected in 2010 and used their offices to lead a nationwide movement to restrict voting rights, while spreading unfounded fears of widespread voter fraud. Republican secretaries of state have used their office to restrict access to the ballot. Democratic challengers are now seeking to fight back. There’s little evidence of in-person voter fraud in Iowa, and the only Iowan convicted for illegal voting in 2016 was a Donald Trump supporter who voted twice because she believed Trump’s claims the election would be rigged. Pate has admitted “we’ve not experienced widespread voter fraud in Iowa,” but he also released misleading statistics to the press over objections from his staff that made fraud seem more prevalent than it is. In contrast to Pate, DeJear, a self-described “voting nerd,” wants to expand the electorate by implementing policies like automatic voter registration. She moved to Iowa to attend Drake University in Des Moines, then worked as head of African American outreach for Barack Obama’s 2012 campaign there. Obama’s reelection effort registered 5,000 new black voters in one of the whitest states in the country, and African Americans made up 7 percent of Iowa’s electorate in 2012, compared to 3 percent in 2008. DeJear sees that campaign as a template for increasing voter participation. “It’s my goal to make sure we have increased turnout in this election,” she says. Governing lists the race as a tossup. In Michigan, Democratic candidate Jocelyn Benson literally wrote the book on secretaries of state, called State Secretaries of State: Guardians of the Democratic Process. At 36, Benson was named dean of Wayne State Law School in Detroit, becoming the youngest woman ever to lead an accredited law school. She ran unsuccessfully for secretary of state in 2010. But in 2018, she says, “It’s night and day. There’s more attention to secretaries of state races than ever before.” Because of the twin threats of Russian hacking and voter suppression, “there’s an increased recognition of the role that secretaries of state play,” she says. Despite the increased attention to these races, they are still overshadowed by higher-profile gubernatorial and congressional contests. In 2014, nearly 37,000 Iowans voted for governor but not secretary of state; Pate won his election by 20,000 votes. “We still need a lot more attention to how important these offices are and how they’ve used it for Republican gains,” says iVote’s Kurz. The secretary of state races come amid a broader push by Democrats to reverse Republican suppression efforts. There are ballot initiatives in seven states, including Florida and Michigan, that would restore voting rights to ex-felons, make it easier to register to vote, and crack down on gerrymandering. If these initiatives pass and Democratic candidates like DeJear, Clyde, Benson, and Barrow are elected, the landscape for voting rights will look very different in 2020.